By Thomas Theobald et. al. Asset price development in individual eurozone countries as a result of the ECB’s expansionary monetary policy requires increased vigilance on the part of macroprudential regulators. Despite the monetary measures, credit growth to households and companies in the euro area remains restrained, so that macroprudential regulation does not yet have to take a restrictive approach. 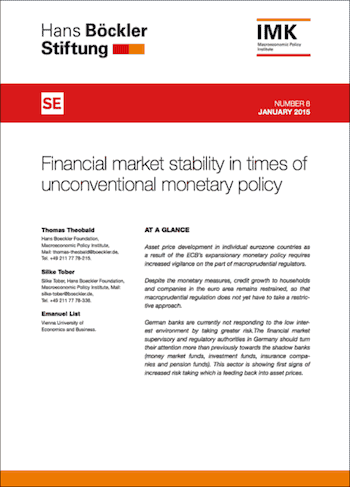 German banks are currently not responding to the low interest environment by taking greater risk.The financial market supervisory and regulatory authorities in Germany should turn their attention more than previously towards the shadow banks (money market funds, investment funds, insurance companies and pension funds). This sector is showing rst signs of increased risk taking which is feeding back into asset prices.